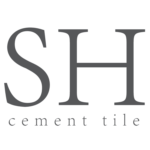 Click to download PDF version of cement tile technical info. Click to download the Sabine Hill Cement Tile sealing sheet. Each cement tile is individually hand made and slight variations, such as in thickness; shade, slight imperfections, irregular edges and crazing are inherent to this type of product. These characteristics add to the products natural appeal and do not compromise the performance of the tile. It is very important when installing to pull pieces at random from different boxes in order to achieve a better distribution and blending of the material. Inspect your order carefully. Sabine Hill will not be responsible for material that has been cut or installed. If installed properly, cement tiles will result in a beautiful, durable, and easy to maintain surface. Sabine Hill provides these general guidelines as suggestions to cement tile installers. Since applications and job site conditions vary, the installer is ultimately responsible for ensuring proper installation and sealing of the cement tiles. For more detailed information and instructions about installing your cement tile, we highly recommend consulting the Cement Tile Manufacturers' Association's excellent and free Handbook. The Tile Council of North America also produces a very detailed publication entitled The TCNA Handbook for Ceramic, Glass, and Stone Tile Installation that is for sale on their website. Prepare a perfectly level, clean, dry, slightly rough surface in concrete. Let the concrete slab surface dry completely before installing the cement tiles, otherwise the moisture in the concrete will evaporate through the tiles, resulting in powdery white limestone deposits (efflorescence). Do not lay cement tiles directly onto fresh (uncured) concrete. IMPORTANT: Some slabs may continue to release moisture on the surface even after fully cured. Test your slab by taping a small piece of plastic (polyethylene film) to the area to be tiled. Make sure all edges are thoroughly taped down. If moisture accumulates on the underside of the plastic, you should apply a waterproofing membrane before proceeding with the installation. To prevent cracking or fracturing from the movement of the substrate and ultimately the earth itself, be sure to include expansion, construction, isolation, contraction, generic and perimeter joints where appropriate. Consult your architect or engineer. Wall tile can be installed over drywall, plaster, cement block, cement backer board (for moist areas). The surface should be flat, smooth, and dry and any loose paint or cracked surface should be scraped off and patched. Be sure to use thinset behind the backer board, not to adhere the backer board but rather to fill voids beneath the backer board. The tiles can be cut using a wet saw with a diamond blade. When installing a pattern we recommend installing the center portion first, the borders and lastly the field tile that will surround the pattern. Tiles can be installed either with a pre-mixed adhesive, such a Mapei Type I, or with regular thinset mortar. In either case use a high- notched trowel (1/2”) to spread the adhesive on the surface as well as on the back of the tile in order to achieve adequate adhesion. When using thinset mortar the back of the tile must be dampened. When using a pre-mixed adhesive the back of the tile should be cleaned lightly. The tiles must be laid by hand and handled carefully to avoid damaging the edges. Once laid, level the tiles using your hands. Using a rubber hammer to do this could damage the tiles surface, and micro-cracks may appear over time). Cement tiles can not be grinded down after they are installed, so it is very important that they are perfectly leveled during installation. Any residue of mortar left on the surface of the tile must be cleaned immediately to avoid staining. Apply a Grout Release following the manufacturers instructions. This will help protect the tiles from being stained by the grout. IMPORTANT: Test grout colors on a loose piece first. Dark grout colors on a light colored tile could stain the tiles, just as white grout on a dark colored tile could. Use a sanded or unsanded grout. Do not use Epoxy grout. Do not use duct tape, gaffer tape or acid tapes directly onto cement tiles surface. Use a rubber float to apply the grout. Immediately remove any excess grout with a clean sponge and clean water. Do not let excess grout dry on the surface as it may difficult to remove and may stain the tiles. Drain any remaining water on the tiles and finish drying with a dry cloth. Don't worry if it appears that the tile color is running. It isn't. Actually the sand screen pad is sanding off a fine layer of the tile's surface. Since this surface layer has color, the fine powder produced by the sanding is also colored, creating the impression that the color is running. It is important to rinse and dry this all away. If polished tiles were installed, you can use a single disc floor machine with a white pad to remove any residue. Remove excess dirt and water and dry with a dry cloth. IMPORTANT: Do not use any acids or alkalines to clean tiles. Use a PH neutral cleaner and fine sandpaper to remove any stains or residues. Do not allow water or other liquids to spot, pond or ring on the surface of the tiles. Cement tile surfaces must be cleaned, free of grease, oil, dirt, wax or any other foreign matter including grout release material. Apply a high quality penetrating sealer for cement and concrete tiles and carefully follow the sealer manufacturer's instructions. Do not place anything on the tile until the sealer is completely dried per manufacturer's instructions. Having an Accredited Applicator apply the sealer will warranty the floor, and it is a one time application for life. If desired, buff the tiles with the floor polisher and white pad using a back and forth motion. This will give your tiles the shine desired. Do this step as long as you like. Some sealers will enhance the color of the tiles. Test the sealer in a small portion before applying. Cement tiles should be regularly moped with clear water. A capful of liquid wax may be added to the water to improve the tiles natural sheen. Never use acids to clean the tiles as they will damage it. Cement tiles should not be installed outdoors in places where freezing temperatures will occur during winter. When installed outdoors in warm weather climates the tiles will acquire a weathered appearance. The colors will look faded and there will be crazing on the tiles. The colors will reacquire their original tones if a color enhancing sealer is applied periodically. Tile installed outdoors will not develop the natural sheen that tile installed indoors will. Cement tiles are manufactured using natural materials. As such it may be possible that there could be color differences between the original order and tiles ordered and manufactured subsequently, so we strongly suggest carefully calculating how many pieces you will need for your installation and then ordering a few extra pieces. Sabine Hill provides these guidelines as suggestions to you and your installer. The installer is responsible for ensuring proper installation and sealing of the tiles. Are there other names that refer to this type of tile? Yes, the terminology used to label cement tiles varies widely in different cultures. The English term associated with colored cement floors is cement tile'. In the Caribbean they are known as mosaicos. They are also commonly called encaustic tile, hydraulically pressed tile, mosaic, French tile, Belgian tile, Spanish tile, Moroccan tile, Cuban tile, Vietnamese tile, Mexican tile, concrete tile, carreau de ciment, ladrillo colonial and piso de pasta. I thought encaustic tiles are made from clay? This is true, and somewhere along the line cement tiles started to be called encaustics, which is not correct. Encaustic tiles are made from clay, not cement, and the manufacturing process is different. Are the tiles painted? Will the design wear off over time? No, the tiles are hand poured so the colors are embedded into the tile. The color layer is 1/8" deep so it will last a very very long time. There are some cement floors that are at least 100 years old, and are still in very good shape. Can you make custom colors, sizes and shapes? Yes, we can either match (as closely as possible) to a sample color provided by the client, or to a cmyk/rgb color. We will then provide a sample to the client for approval. Custom sizes and shapes are also available. Everything custom will take a bit longer to produce, and there may be an added cost. Absolutely. The client can either submit a computer drawing (AutoCad, Illustrator or Photoshop drawing), or the client can submit a sketch and we will work closely with you on finalizing the design. Once the design is finalized, a hand made metal mold is created. This process also takes a bit longer, and an additional cost is associated in making the mold.